Sometimes you just need to get the hell out of town. If we’re being real (aren’t we always?) you deserve to treat yo’self to a mini vacay, with the only real plan being wine (much wine) at your destination, because adulting is hard you guuuuuuys. Enter Blue Wren. 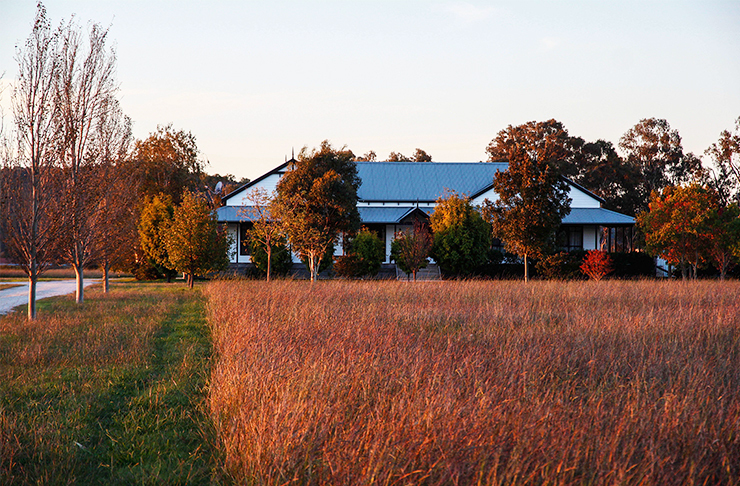 We’re talking 65 acres of stunning views, just a stone’s throw from the town of Mudgee, in the wine filled (ICYMI wine = important) region of Central West NSW. I’d been told they’d just scored their first ever Chef’s Table, at their Chefs Kitchen restaurant thanks to new owner Kip Harris, aaaaaaaand that you could even stay on site. Now for anyone who loves the idea of a cheeky weekend getaway, but isn’t so keen on rock, paper, scissors for deso #notdriving, this one’s for you. Along with an on site restaurant and tasting room, this instaworthy spot also lays claim to the Farmhouse @ Blue Wren, meaning you and your food baby can tuck yourselves in, luxe style, in cute AF matching robes. Okay, so back to the food. When we arrived at Chefs Kitchen it was ‘Straya at her beautiful best. We made our way down the long drive as the sun set behind the vines and a gaggle of geese (for reals) waddled in front of us before gliding down the stream near the vines, alongside the chicken coop. The Instagame is strong at Blue Wren and the shots are errrrrywhere. We were greeted by a roaring fireplace and a big ol’ wall of floor to ceiling wine, just how we like it, and for somewhere as intimate as Blue Wren I was impressed by how spacious the setup was. With all the usual suspects accounted for—great lighting, chilled beats, and open kitchen I was ready to get my feast on. You can tuck in to a five-course tasting menu with matched wines for under $100, or, you can BYO for just 10 dollarydoos. A word of advice: come hungry. While the team here are known for experimenting with flavours this isn’t one of those ‘I wish Maccas was still open’ type of degustation situations, so BYO stretchy pants. For starters, think celeriac soup with broad beans, garden fresh peas and crunchy asparagus, topped with a poached egg courtesy of those chooks we saw outside, and finished with the perfect shaving of Parmigiano-Reggiano and truffle oil (always a winner). The menu continues to push the boundaries with Himalayan rock salt seared scallop and pork belly (that got your attention), sage thyme barley, caviar (always a good idea), and a crunchy pork neck croquette with crustacean curd. French influence is huge here and we’ll forgive you for checking the room for any judgey eyes before raising plate to tongue and licking the final remnants of the duck liver ice-cream brûlée, it just goes so damn perfectly with the crispy skin duck breast. It’s not often you try something and have a literal mind = blown moment, that is until you try the vegemite foam. Intrigued? Course you are. Taking a sous vide chateaubriand, with cacao, smoked potato puree, pear and black pudding crisp, they finish it all with vegemite foam (forget gravy guys) and a side of horseradish snow (that packs a delicious punch). We’ll remind you again, #stretchypants4thewin, because the dessert game here is strong and will be requiring all of your second stomach. When we visited, the cinnamon doughnut with malt custard, banana ice cream, coffee crunch, pistachio crumb and Callebaut chocolate with white chocolate bubble was the ultimate, I’m-totally-on-a-vacay, dish. 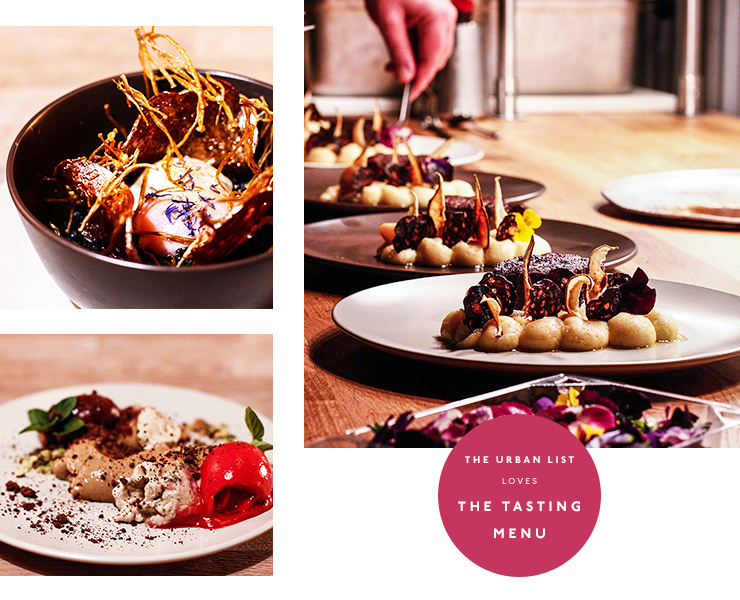 Blue Wren is the kind of place you could easily stay for twice as long as you’ve planned, and the Chef’s Table is the perfect mix of fancy meets clever, with signature regional style. So gather the crew, there’s plenty of room.